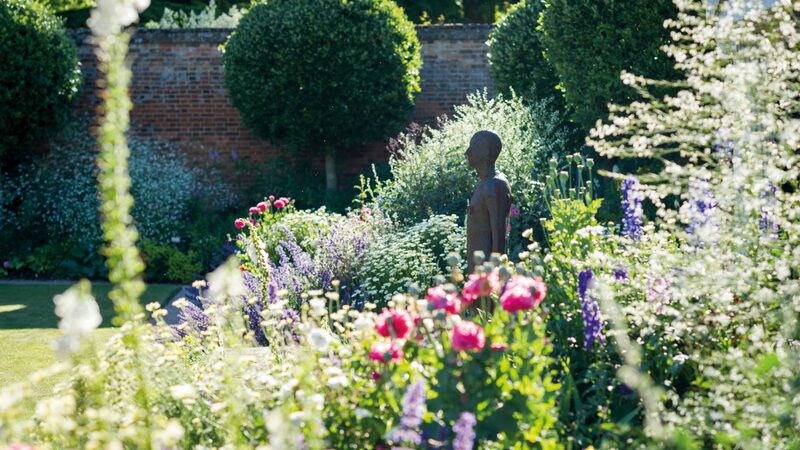 During the last year, two significant sculptural additions have joined the grounds at Nevill Holt. Receiving guests with open arms to the Cedar Lawn is Allen Jones’s monumental Dancers (2014). Two figures, a man and a woman, are joined together in dance. 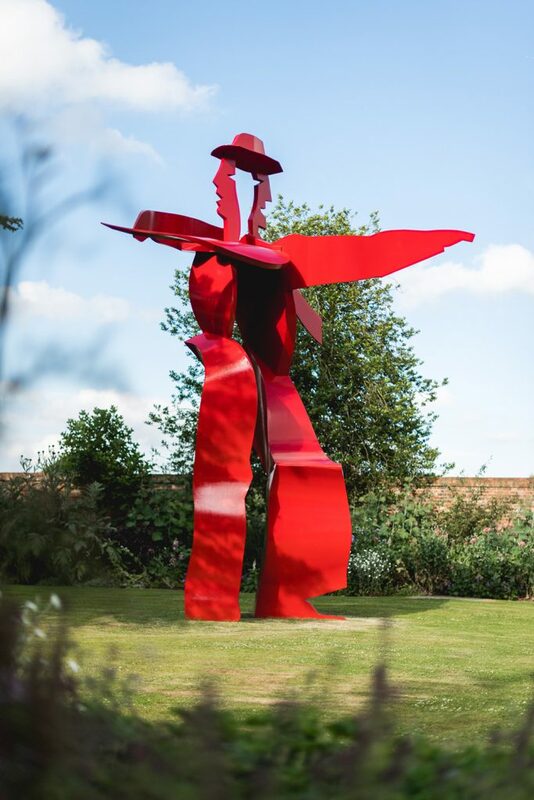 Towering 7 metres high, in striking red, the figures are composed of four planes of painted steel rendering a formation that is different from every angle. The planes of steel are thin, eliminating any one single view so that to experience the volume of the dancing figures, the sculpture must be seen in the round. From one angle you might be able to see only the female, from another you can catch the fleeting wisp of the man’s tie. The playful composition is brought to life in dance as the viewer begins to move around, catching the various elements in movement. The theme is one that Jones began working with for his first ever public sculpture Tango commissioned for the Liverpool Garden Festival in 1984. Jones’s subject matter is always contemporary by nature depicting the life of the city, but as he notes “Bodies united in dance have been used since antiquity as a personification of creativity”. His technique using flat sheets of steel was born out of sculptures that he had begun making from cut-out forms in paper, the flat sheets of paper were manipulated and twisted to create small figurines. 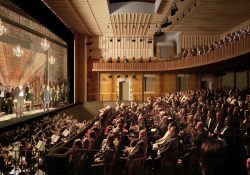 Dancers was previously exhibited in London on Piccadilly during Jones’s 2014/2015 retrospective at the Royal Academy of Arts. Allen Jones is a pioneer of British Pop Art, a movement rooted in London in the late 50s where Jones has lived and worked all his life. 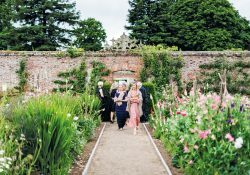 This work is the fourth to join the collection of sculpture in the Nevill Holt gardens. Taxi (2007) and Little Banquet (2006) can both be seen on the main lawn and A Carefree Man (1991/92) is now sited in the Italian Garden. 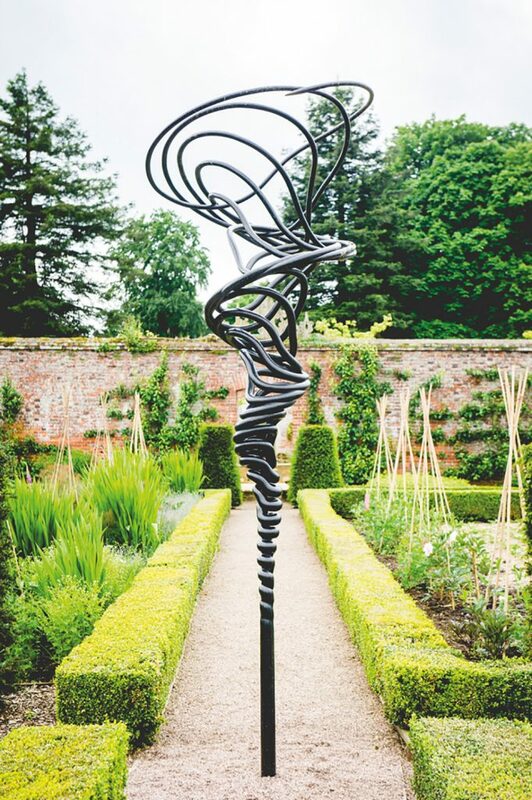 Rising from the central point of the Kitchen Garden is a work by fellow Royal Academician, Conrad Shawcross. Shawcross’s Manifold 2 (9:8), (2000) is a dynamic spiralling bronze, growing up out of the earth like the produce by which it is surrounded, marking the middle of this otherwise almost symmetrical garden. Shawcross is well known for his mechanical compositions. His sculptural and installation work explores historical methodologies, theories and discoveries from past figures in science, philosophy and the arts. In this case, Manifold 2 (9:8) was designed by the artist using a replica of a Victorian Harmonograph that he made. A Harmonograph is an instrument comprised of two pendulums, one attached to a pen and the other to a sheet of paper and is used to create geometric drawings from a result of the moving pendulums (curved elliptical images similar to a Spirograph). This sculpture is based on a musical chord for which Shawcross has used the harmonograph to record the oscillations of the sound waves on paper as a basis for the work, later transferring them to a three-dimensional artwork. Despite its organic appearance, the sculpture was devised using careful mathematical ratios, the result being a physical representation of a musical sound. It is the first work by Conrad Shawcross to join the collection at Nevill Holt. His work can be seen across the city of London with major public commissions at The Francis Crick Institute, Dulwich Park and The Energy Centre in Greenwich Peninsula.